Some of my most peaceful moments in my life was when I lived in San Francisco. I had a four-level rickety home that was built in 1929, and as you walked along the floors, the creak of each wooden plank reminded you it was built in 1929. My boyfriend at the time and I gutted the entire house and remodeled, ripping out the dark wooden cabinets from the ’50s; the Astroturf on the floor in part of the kitchen that used to be the foyer to the front door from the late ’70s (yes. for real. Astroturf was in my kitchen); and broke down the suffocating walls to let light in. Underneath the dirty slime-green shag carpeting was hot-pink carpeting (no joke), and underneath that were glorious wood floors, original from when the house was built. My favorite part of the remodel was when we created a garden in the back. Because the garden was on the ground floor (obviously) and the main living space was 3 floors above that, it was quite a dangerous walk every morning down those wet, slippery, rotting planks that we called “stairway to lawsuit” if any of our guests tried to venture down. We hadn’t gotten to replacing the deck and stairway yet, something called ‘$20,000’ got in the way. But every early morning, I’d put on my gardening gloves (to keep my hands warm but more importantly to provide me with a good holding grip as I went down those stairs) and tend to the herbs, vegetables and the most ginormous arugula monster ever seen. That thing was so big that I joked it provided shade for the entire house. Each morning was my alone time. I did my own garden-meditation thing and all was peaceful. 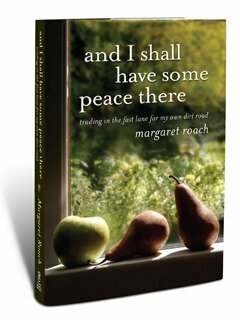 I want you to meet Margaret Roach, my garden guru, though I bet most of you know her already. 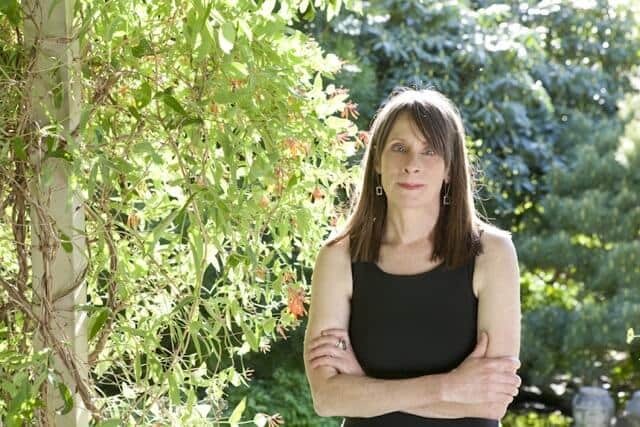 She’s the publisher of Away to Garden and former editorial director for Martha Stewart magazines, books and internet. She knows peace, but it wasn’t until she one day just dropped everything, quit her job and returned to her “home,” the garden. I’ve been friends with Margaret for the past couple of years, she inspired a yearly Summer Fest and Fall Fest which I was a part of the first year. To celebrate her book launch, I thought I’d make soup. Because reading her book just makes me want to make warm, comforting, peaceful garden soup. 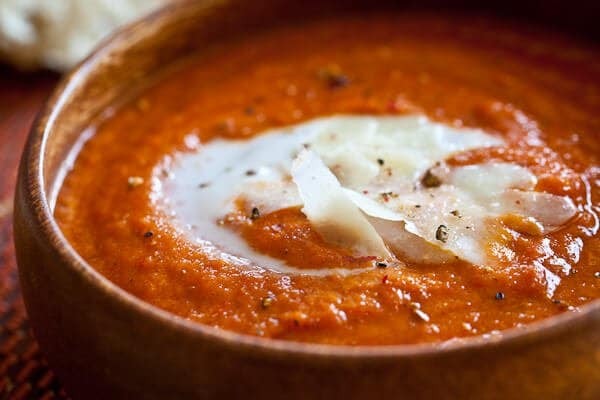 Specifically, Roasted Tomato Soup, loaded with other vegetables from the garden, onion, bell pepper and a bit of jalapeno to give it a nice kick. The tomatoes are from my friend, Patsy’s garden, another master gardener who lives near me. Margaret, here’s to you, my friend. 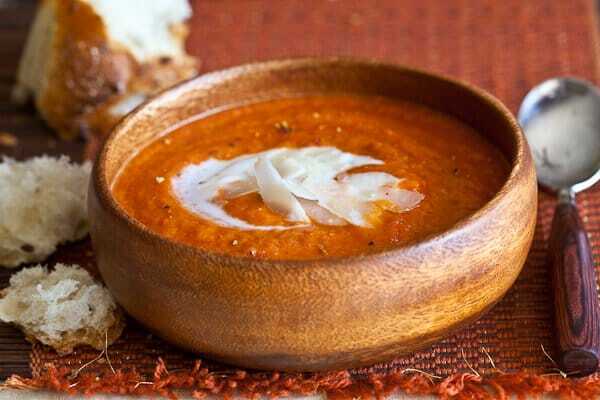 The trick to roasted tomato soup is to NOT make it taste like warm marinara. I’d rather have my marinara on pasta than in a bowl! So there are certain herbs that I don’t use – oregano and basil. 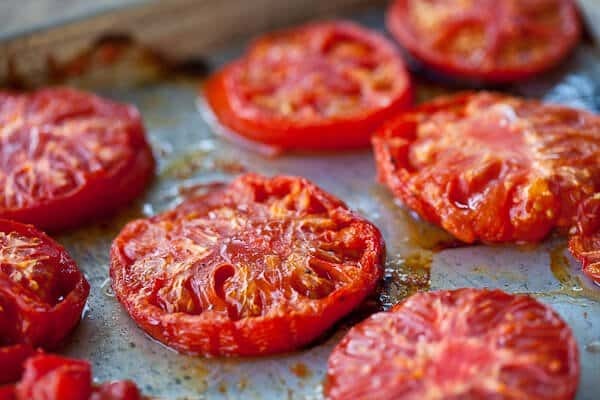 Instead, I use smoked paprika to enhance the roasted tomato flavor, giving it a little smoky boost. I also add half a seeded jalepeno, onions and bell pepper to the roasting pan. All gets blended after roasting. Absolutely beautiful tomatoes, fresh from Patsy’s garden. 1. Preheat oven to 375F. 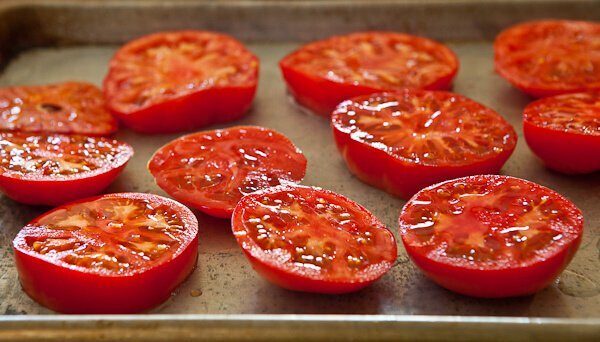 Arrange all vegetables on baking sheet. Drizzle olive oil all over. Roast for 20 minutes. Roughly chop all vegetables. Add all vegetables, smoked paprika, garlic powder, salt, pepper, vegetable broth and grated cheese to pot large enough so that when you use your immersion blender, it doesn't splatter all over the place. Blend in pot until you get a nice puree. Bring to simmer, taste and adjust seasoning. Add all ingredients to blender and set on your "Soup" setting. Taste and adjust seasoning. 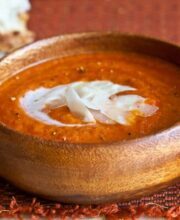 Garnish with additional parmesan cheese, a turn of the pepper mill and serve with crusty bread.